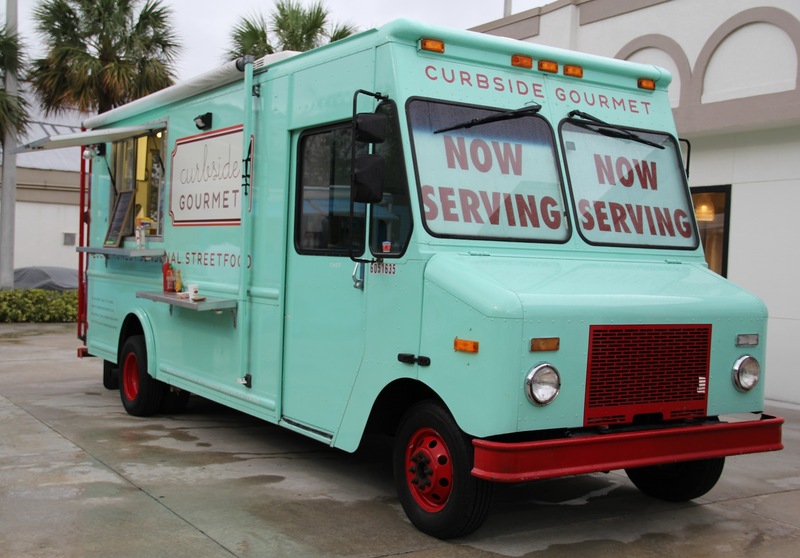 Curbside Gourmet is a South Florida based food truck serving up seasonal dishes featuring local ingredients. They offer breakfast, lunch and afternoon snacks as well as catering for events. We stopped by Curbside Gourmet at a local #TEAMAIME event in downtown West Palm Beach to see what all the buzz is about! For breakfast they offer a daily Frittata, Breakfast Burrito, and other morning treats. In the afternoons they serve up Buttermilk Fried Chicken Sandwiches, BLTs, Black Angus Burgers, and Mojo Pork Tacos, among their fresh menu offerings. For the event, they had a set menu of the Crabcake Sliders, served with a lemon tarragon aioli on a potato roll, and their Lemongrass Coconut Chicken served over a bed of papaya salad. We also got a side of the Truffle Fries. All were delicious! Their dishes have great flavor and are visually beautiful. Even their presentation in disposable dinnerware was fabulous. The people are also really nice and I love their truck – the whole vibe. Tuesday through Friday you can catch them at S. Dixie Hwy and Flamingo from 11:00-2:30pm.